On June 12th in the evening a vehicle in Linkwood was broken into - the driver’s side lock was punched in and the window was bashed in. The resident’s credit card (from a wallet hidden in the vehicle) was immediately used for fuel at Sunny’s gas station on Stella Link. HPD believes the criminals were trying to steal the truck. Many neighborhoods are getting hit by these wandering criminals who walk up and down streets, in the middle of the night checking if vehicles are open and looking into them to see if there is anything of value inside. PLEASE LOCK YOUR VEHICLES and PLEASE DO NOT KEEP ANYTHING OF VALUE in your vehicle. HPD and SEAL Security have both said numerous times that criminals have been know to break into vehicles only to find an empty bag or a box. CLOSE & LOCK your garages and do not keep key fobs (electronic devices like those embedded in keys/key chains for unlocking cars, garages, etc.) in your vehicles even when they are garaged. LOCK YOUR GATES AND FENCES. If you don’t have locks please get them. PLEASE CONSIDER MOTION CAMERAS for your property. On a recent RING video a wondering criminal was walking up and down the block checking vehicles but as soon as the motion light came on - he turned around and left. In summertime, neighborhoods usually have a bump in crime. We have not yet experienced an increase in crime. In fact, our crime rate in Woodside has been below our usual average. We attribute that to SEAL Security, HPD, our Citizens On Patrol and observant residents. Send an email or inform your trusted nearby neighbors that you are going out of town and to please keep an eye on your home. Regular garbage collection is every Thursday. Our neighborhood has Heavy Trash day EVERY third TUESDAY of each month. 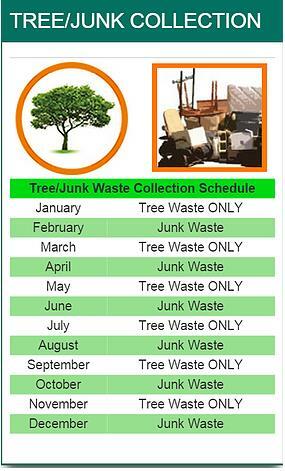 In alternating months, residents may dispose of their Tree Waste and Junk Waste at their curbside. For more information go here. Recycling schedule is attached here as a pdf. Woodside follows Schedule A (yellow). Get detailed information about the City's program for Recycling: here. Rollout! is a simple app to make figuring out the City of Houston's trash pickup easy! Forget about peeking outside to see if your neighbor's bins are out, with Rollout! use your phone to look up your location and instantly let you see your schedule for your neighborhood. You can set up reminders to tell you when to take out your trash to make sure you don't miss recycling day again from your computer or your smartphone. The Earth911 websote allows you to put in your zipcode and then what ever you want to recycle and he shows you were you can bring it to recycle/get rid of. Get detailed information about the City's program for pick-up of Heavy Trash and Recycling here. All Solid Waste Services Collection Day Information can be found at the following link: http://www.houstontx.gov/solidwaste/service_schedules.html.